Peripheral Nerve Blocks and Peri-Operative Pain Relief has been extensively revised to reflect changes in contemporary practice. Provides a detailed foundation upon which trainees and practitioners can develop their skills in peripheral nerve block. Explains fundamental principles such as the mechanism of action of local anesthetic drugs, needle types, as well as toxicity and safety. Uses a consistent, user-friendly format to present each nerve block’s indications, contraindications, relevant anatomy, technique, adverse effects, and complications. Provides a complete, all-in-one resource in which each block is described in terms of its relevant anatomy, its ultrasonographic anatomy, and its clinical performance. Shows you how to proceed using high quality clinical photographs, radiographic images and specially commissioned line drawings. Offers "Clinical Pearls" in every chapter to help you obtain optimal results. 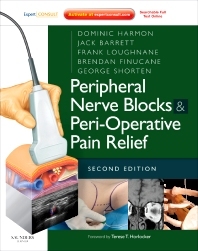 Each chapter in this new edition is supplemented with practical advice and examples of how to use ultrasound-guided peripheral nerve blocks to its greatest effect. Includes a brand new chapter on Transversus abdominis plane block. Features more than two hours of narrated video clips via the Expert Consult online platform to demonstrate a full range of nerve block procedures and enables the user to access full text and images from any computer. 7. Principles of ultrasound guided peripheral nerve blockade. 8. Ambulatory peripheral nerve blockade. 9. Which block for which surgery. 10. Design and implementation of a training programme in PNB.